American Hydro was subcontracted to perform concrete removal on the vertical containment building of Waterford 3 Nuclear Power Station. 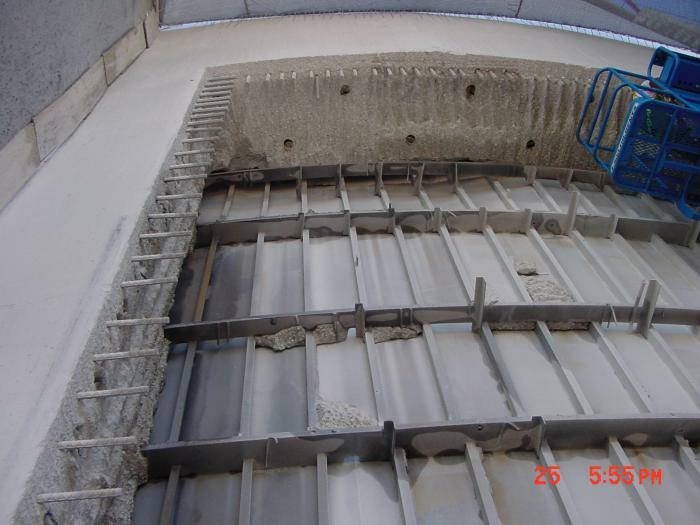 American Hydro had performed concrete removal on nuclear containment buildings many times prior to this structure, yet this project involved a detailed cut geometry and process. In this case, the job entailed removing the 20 inch perimeter of a 40’ by 30’ block on a vertical wall. In addition to the unique cut geometry, the 36 inch concrete depth was to be removed in two passes first exposing 24 inches and then removing the remaining 12 inches with the final pass. American Hydro implemented its vertical wall hydrodemolition robot to remove the concrete within the provided time. Even while removing 36 inches of concrete at heights reaching over 40 feet, the cut was performed within a tolerance of 1” of the parameters.